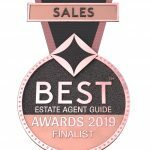 The Best Estate Agent Guide Awards 2019 celebrate and reward the very best. A listing in the Best Estate Agent Guide is awarded for exceptional performance and customer service following a rigorous and thorough assessment of c. 15,000 brands and 25,000 estate and letting agency branches across the UK, using a combination of data analysis – including web performance, the time it takes to sell or let homes and fall-through rates – and mystery shopping, all conducted by Property Academy and the UK’s leading property portal, Rightmove. Meyers also took the Gold Award in the Customer Service (Sales) category in the Experts in Property Annual Awards last month. With around 80 West Country estate agencies all vying for the top spot in this most important factor, the awards were judged using feedback from actual buying and selling clients. For more information, to arrange a free property valuation without obligation, or just for a chat about any property-related matter, pop into or call any of the Meyers branches.